Access to over 90,000 classical music tracks — from Gregorian chants to present-day recordings. Search by combining multiple fields, including: artist, composer, instrument, genre, time period, work or opus number, soloist, ensemble, record label and more! Listen to multiple versions of works to enable comparative listening. 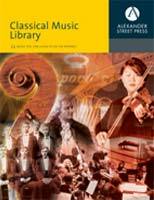 The Classical Music Library is part of the Alexander Street Press Music Online: Listening Plus family. It aims to offer the widest selection of performances by great artists, and to provide unusual selections required for teaching that may not otherwise be available — such as oboe solos, for example. If you like this resource try Naxos Music Online for more streaming music!